All transactions are safe and secure with a reliable history in online purchasing behind each of our associates. 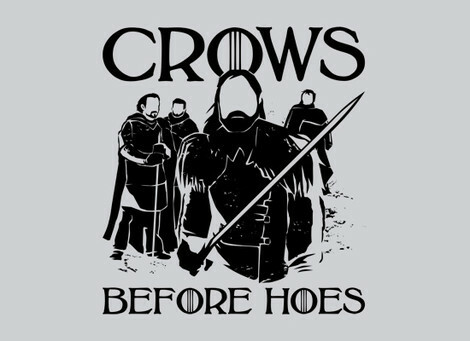 Buy the Crows Before Hoes t-shirt to own Game of Thrones clothing and merchandise. This Game of Thrones Crows t-shirt features the motto that everyone in Westeros knows the members of the Night's Watch live by, Crows before Hoes. Whether you are part of the sea faring people that make up the House Greyjoy or you belong to House Stark in the north, the strict honor of the Crows is never forgotten. Wear this attractive piece of clothing as you play a Game of Thrones board game or choose another A Song of Ice and Fire t-shirt from the gallery to add to your collection. In addition to the Crows Before Hoes tee above, browse the Game of Thrones Clothing Gallery for more apparel like men's and women's clothes, kids shirts or hoodies.